We can consistently offer quality products at competitive rates. We can provide the equivalent products against many of the branded pigments. We can customize and package our extensive product range as per our clients’ specification. Footed in the year 1992, Hem International is amid one of the credible business names thoroughly engrossed in manufacturing, trading and exporting a wide variety of products which include Phthalocyanine Pigments, Pre Dispersed Pigments, AZO Pigments, Industrial Pigments, Color Pigments, Paint Pigments, Ink Pigments, Textile Pigments, Plastic Pigments, Masterbatch Pigments, Cosmetic Colorants, Chrome Pigments etc. We started as a supplier of Pigments catering to domestic and international clients. Gradually, we capture good market share and also gained handsome experience of the Pigment market. Then we started manufacturing of Phthalocyanine Pigments. 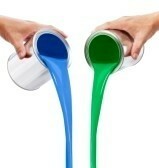 We are manufacturing Pigment Green 7, Pigment Blue 15.0, Pigment Blue 15.1, Pigment Blue 15.3 and Pigment Blue 15.4. Hem International is still supplying and procuring raw materials for Paints, Coatings, Ink, Paper, Rubber, Plastic and Textile industries. Our sales philosophy is to supply consistently high quality and technically advanced products, always originating from our esteemed and established sources.